Marketers: Is Content Marketing Relevant to Buyers? More than 1,100 North American marketers are spending 26 percent of their budget on content marketing projects, and 51 percent say they plan to increase their spend on content marketing over the next 12 months, according to Content Marketing Institute research. Great, right? Not so fast. IDC research indicates current marketing content such as white papers, webinars and videos are too lengthy and not as relevant to buyers as they could be. As a result, much of the content marketing investments are just not returning the dividends marketers expected. Fortunately, making content more relevant is not that difficult. A few best practices can drive tangible results and a significant competitive advantage. Why is relevance so important to buyers today? When content is not relevant to the buyer, it has an impact on marketing effectiveness and the business. Making content more relevant to buyers can have a substantial impact, improving effectiveness and driving a tangible ROI to the business. Although buyers measure content on how relevant it is in helping them make a decision, most marketers measure the success of content marketing programs “by the pound,” producing rich deliverables where size is a badge of honor. However, more isn’t always better. 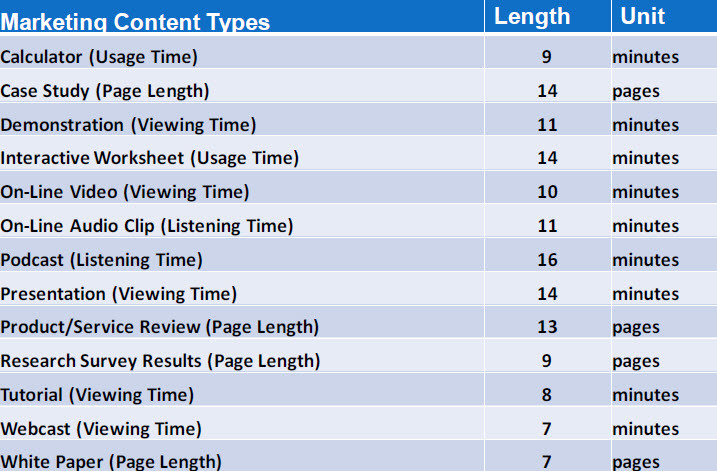 IDG Connect asked buyers about the ideal length of various marketing content. IDG found buyers want content to be much more concise / shorter than most marketers would believe. For instance, the ideal white paper is only seven pages long. However, marketers typically produce white papers that are often 10 pages or more. And it’s not just white papers that are not meeting expectations. Buyers also say the “shorter the better” works for them when it comes to viewing or listening to videos and podcasts. Meeting buyer expectations often requires marketers to find ways to cut current content by one-third or more and continue to deliver relevant information for buyers. Focus on producing relevant content within the number of pages for print materials and time spans for video and podcasts based on buyers’ expectations outlined in the IDG research. Replace one-size-fits-all content with personalized content to match the buyer’s persona, stage in buying cycle, industry, geographic location, size and pain points. Content marketing groups often measure success based on how much content is produced within a given time frame. As content marketers produce more and more content, very little of the older collateral is retired and the number of items keeps multiplying. Consequently, buyers have to wade through a plethora of content to find the right tools that facilitate their buying decisions. Relevance is being lost in a sea of content. Map content development to the buying cycle (here are templates to help you do this), delivering just the right pieces of content to enable buyers to navigate the buying process with their executives and other stakeholders. Determine if the new content should replace existing content. With the Great Recession fresh in the minds of B2B buyers, “frugalnomics” reigns and it is important to prove your proposed solutions can reduce costs, drive incremental revenue or deliver some other tangible value. However, according to IDC research, the content produced today remains very product centric, focusing on features and functions of the seller’s products rather than helping buyers understand the product’s potential business value and results. Early in the buying cycle: Buyers need help understanding and prioritizing the issues your solution can address. Craft content to help buyers diagnose and prioritize issues, and quantify the cost of maintaining the current status-quo. Middle of the buying cycle: Buyers will need content that builds a solid business case to justify the cost of the solution to executives. Later in the buying cycle: Buyers need content to assure executives the selected solution is the best possible value. Shorten the length of the content to better match buyers’ expectations. Implement content review and retirement policies to end the endless proliferation of collateral. Guide buyers to the right content at the right time so they do not have to wade through catalogs of collateral. Personalize the content so it speaks to buyers and their needs. Focus the content on the buyers’ issues and outcomes, versus the all-too-common product-centric approach.